Posted 7/15/2011 7:43pm by Josie Hart. You may have noticed a change in the veggies you are seeing on a weekly basis now that we are moving into the end of July. Our greens are being replaced by root crops such as carrots, beets, turnips, and radishes. We will continue to grow greens, but we may not have them on a weekly basis. We find that both the plants (and the members) need a break from greens this time of year! Our harvesting gears have fully shifted towards squash, potatoes, peppers and yes tomatoes in the next few weeks! Now that our root crops are ready for harvest get ready to do some roasting in the oven! Slice or cube your roots and combine with fresh herbs, oil, salt and pepper. Roast them in the oven for a delicious and colorful flavor sensation. Too hot to turn on the oven? Use your grill! Grilled squash is one of our favorites at the farm. Try all of our different varieties of squash to see which one is your favorite. If you don’t go to our website regularly, try it out! We have some really great recipes that highlight your current CSA produce. When we add a new recipe to the website, it will appear right on the home page for your convenience. All you have to do is click on the link, read it over and go from there! If you missed our newsletter and would like to read it again you can always access our old issues under the “about us” and “news and blogs” section on our website. In a food processor pulse together all ingredients except oil and water until arugula is finely chopped. With motor running (if possible) add oil in a stream, blending mixture until smooth. Sauce may be made up to this point 1 week ahead and chilled, its surface covered with plastic wrap. Bring sauce to room temperature to continue. Stir in 1/4 cup hot water plus additional for thinner consistency if desired. Posted 7/15/2011 6:48pm by Vicki Phillips. Having never met a roasted vegetable I didn’t like, I decided to roast together the kohlrabi bulb, broccoli and squash. Roasting the broccoli and kohlrabi bulb was definitely an experiment, and I didn’t know if these three very different veggies would complement each other on the palate. I employed the typical roasting method of cubing the vegetables, giving them a light bath in olive oil, and sprinkling liberally with kosher salt and pepper. Into the oven they went, at 400 degrees for 20 minutes. This dish was ok but not great. In retrospect, I should have sautéed or steamed the delicate broccoli and squash to allow their fresh flavor to emerge. The high temperature and long cooking time was just too much for these young, tender babies. As for the kohlrabi, I actually liked the greens better than the bulb. Judging from how the leaves felt when raw, I didn’t think they’d ever get soft. But cooking low and slow for a long time, these greens added a slight bitter taste and paired well with the kale and chard. In fact, I’m on a veritable "mess o’ greens" kick. This week our distribution included even more greens, and yesterday I cooked them all together. Confidence intact, I didn’t feel the need to cook them separately as I did last week. I just melted some olive oil and a little bacon grease in a pot, threw in the greens and cooked them slowly, covered, for about 40 minutes. Four different kinds of greens! Kohlrabi greens, beet greens, turnip greens and kale ... delicious and so healthful. Another experiment involved all the stalks from two weeks of greens, which I used to make a big pot of broth flavored with bay leaves, oregano, salt and pepper. I froze nine bags of two cups each. Typically I find vegetable broth really bland and prefer chicken broth instead. So we’ll see how my greens broth turns out when used to make soup. Also in the vein of trying new culinary methods, I finally decided to use the oregano I’ve been collecting and drying for a few weeks now. It didn’t smell very pungent so I didn’t have high hopes. But when I crushed it and added it to pizza sauce, the flavor really came alive. It tastes different from dried oregano you buy at the store, with a slight hint of anise. This weekend Ray and I are going out of town again, this time a road trip to Lincoln to visit my son and daughter-in-law. Keith and Amber are foodies, too, and I’m giving Keith a chef’s knife for his birthday. So I’m packing up all my vegetables and herbs in a cooler and will look forward to a fun weekend of cooking. I’m anxious to see what ideas they have. If they don’t suggest it, I’ll put in a vote for a mixed greens salad with the beets and goat cheese. Also a brunch egg dish using the peppers, squash and carrots. And then I’ll suggest pesto with the ton of basil we got. Hmmm, micro-managing? Maybe I’ll just hand over everything and sit back and let them make all the decisions! Posted 7/8/2011 6:08pm by Josie Hart. We hope you all are enjoying the fresh herbs we have been harvesting. Now is a great time to make up a batch of cilantro-basil pesto, invite some friends over for a BBQ and enjoy life. Send your friends home with a little extra cilantro that they can enjoy, too and embrace the community that good food can create. Susan Evans cooked up some amazing kohlrabi slaw for our members this past week and it was very well received! Please note that we are changing the time of her tasting/demo to 4:30 p.m. – right at the start of distribution. So if you have missed her in the past, you will be able to taste her next treat, gazpacho! She will be at Chatfield on August 4 and possibly at York St. in August as well. this week's recipe – easy! Mashed cauliflower tastes similar to mashed potatoes but with fewer carbohydrates - which can make you feel very sluggish in the heat of the summer. Top with chopped herbs and grated cheese if you like. Bring a large pot of salted water to a boil. Add cauliflower and cook until very tender, about 10 minutes. Reserve 1/4 cup of the cooking liquid and then drain well and transfer cauliflower to a food processor. Add oil and reserved water, 1 tablespoon at a time, and puree until smooth. (Or, mash cauliflower with a potato masher). Season with salt and pepper and serve. Welcome to harvest day at the Chatfield CSA! We hope you’re ready to get up at 4:30 a.m! We thought it would be interesting to take a look all the details that go into our day before we see you all at distribution. Here is a little timeline so you can get a picture of farm life. 5 - 5:30 a.m. – our growers arrive and prepare materials for volunteers and harvest. 5:30 a.m. – our highly esteemed early morning volunteers show up to begin harvest. 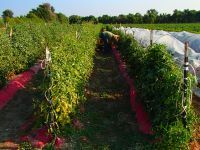 5:30 – 8:30 a.m. - the team works as fast as they can to cut, pull, dig and pick each crop before the heat sets in and causes any wilting. While people work, they often are deep in the mud, bent down in a hedge or raised bed and on their knees for many hours. After each crop comes in, it is placed in cool water and stored in the walk-in immediately. 8:30 a.m. – the next team of volunteers arrive to help wash and sort the produce. Every item is washed thoroughly in giant ice cold tubs, while weeds, mud or anything else is removed. After produce is sorted, washed, labeled and organized the CSA staff weigh all their crops and divide the harvest into individual allotments. The volunteers go home and the staff set-up for distribution. Noon – everyone from the harvest team goes home for much needed rest and relaxation. 3:00 p.m. – everyone arrives back at the farm to get ready for distribution. 4:30 – 6:30 or 7 p.m. – distribution at York St. on Tuesday and Chatfield on Thursday. 7:00 p.m. - the staff clean up and prepare the left over produce for a donation pick-up on the next day. Wow! As you can see this is a very long day for many people dedicated to getting you the freshest vegetables possible! We do acknowledge that a few members would like to come early to pick up the share. We would love to accommodate everyone’s busy schedules, but starting at 4:30 p.m. is the earliest we can have our produce ready. We thank you for being patient while we set up for distribution and appreciate all your wonderful feedback. Posted 7/8/2011 2:59pm by Vicki Phillips. Three of my initial reservations about joining a CSA have indeed materialized. First, what to do with all the vegetables when you go out of town? That turned out to be easy. Our friends Alan & Deb came by and picked everything up before we left for Atlanta for a week. The second concern hit me after I got back home on Tuesday with this week’s big beautiful load of produce. Yikes, I thought, as it all lay on the counter looking at me. How on earth will we eat all this? And the third cause of CSA jitters was the kohlrabi, which I’ve never before seen nor eaten, much less cooked. Returning from Atlanta, Ray and I had stopped on the way from the airport to pick up our distribution. By the time we got home and unloaded luggage — and then spent 40 minutes washing and green-bagging all the vegetables and herbs — I was too tired to cook so we went out to eat. Moreover … once again … we already have dinner plans with friends this coming Fri. and Sat. nights, leaving only four dinners to use up everything. Some items will be used for lunches, too, but all in all I began to experience my first twinge of vegetable anxiety. It’s now Thursday and already I’ve made a good start. Yesterday for lunch I did an easy skillet Napa cabbage with Polska kielbasa, with enough sausage left over for another meal. Last night I made shrimp salad using the head lettuce and dressed it with an Asian dressing using Thai basil, cilantro, lime, fish sauce and a few other ingredients. Wow, an excellent, high-flavor, low-cal weeknight dinner. The only thing I did wrong was to cut up the lettuce too small and then bruise it during tossing. The tender young lettuce we’re getting from the Denver Botanic Gardens at Chatfield's garden is a lot different from what’s typically available at the grocery store in that it’s far more delicate. You have to use a light, gentle touch with it. Last night’s salad was so good — and I had extra shrimp and cilantro left over — that I made it again today for lunch, this time with the mixed greens. Tonight we’re having the leftover Polska kielbasa with a “mess o’ greens,” as they say in the South. Often, Southerners mix different types of greens together, which I decided to do with the kale, chard and kohlrabi greens. But I’ll cook them individually in case they don’t all get done at the same time. I also want to sample them separately before combining them, since I’ve never tasted kohlrabi greens and only once or twice have I ever cooked chard. We may just eat everything this week, after all! I’m noticing one really positive change in my meal-planning strategy: more focus on vegetables and less on meat. Determined to use everything up from the CSA distribution, I’m approaching the vegetables as the main attraction and meat the side thought. I also like using sausage, not only because it pairs well with greens but also because it’s already highly seasoned so preparation is simple. Furthermore, its intense flavor means a little goes a longer way, so we end up eating less quantity. The Polska kielbasa worked great, and I plan to cook Italian sausage with the spinach for an upcoming meal. I want to experiment more with different kinds of sausages I’ve never cooked with before, like chorizo. Recipes, anyone? Posted 7/1/2011 11:58am by Josie Hart. Dear CSA shareholders, Wow, what an amazing week of vegetables we have lined up for you! We hope you are ready to do some serious cooking, because we have a beautiful bounty of delicate baby squash, lush broccoli and most likely one or two vegetable varieties you may have never seen before! This week Susan Evans of Chrysalis Herbs will be providing a tasting and recipe to take home using some of the more rare vegetables this week at distribution. If you have any questions on how to prepare a certain vegetable please feel free to ask her. She will be at York st. Tuesday, July 5 from 5-6 p.m. and also at Chatfield from 5-6 p.m. on Thursday, July 7. If you haven’t already signed up for our recipe exchange at your weekly CSA distribution, please do so. We will be taking turns sending a recipe to each other utilizing at least one CSA veggie to help generate good ideas for cooking at home. Look for a clipboard at the check in table at your weekly distribution or feel free to ask a CSA staff member for more details. • In a blender, combine onion, salsa, cilantro, garlic, jalapeno and salt. Blend until smooth. Stir in softened cream cheese. Pour half of the sauce over the chicken and stir until well coated. Reserve remaining sauce to pour over top of the enchiladas. • Scoop about 1/2 a cup of chicken mixture in each tortilla, roll up and place side by side in a lightly greased 9×13 pan. Pour reserved sauce over finished enchiladas and cover with tinfoil. Bake for about 30-35 minutes remove foil and sprinkle evenly with shredded cheese. Bake uncovered for 10-15 more minutes. Not all kids love eating beets, but they may love a craft project with them! • Buy one pair white cotton kids socks and rubber bands ahead of time. Tie the rubber bands around the socks in stripes (like tie dying). • After you boil or steam your beets, save the heated colored water. Add half a cup of vinegar and half a cup of salt to the water. • Add 4 tablespoons of alum or cream of tartar to the pot. Bring the red water to a very soft boil once again. While the water is barely boiling, add the socks to the mixture. • Your kids will love doing this, because you are making sock soup! Yuck! • After 1 ½ hours, pull the socks from the mixture using tongs and let cool. • Rinse slightly in cold water. • Remove rubber bands and lay socks out to dry. • Enjoy having pink tie dyed socks!! If you want them to be red, cook them for at least three hours and remove, making sure the water is not boiling too much (don’t throw these socks in the washer - hand wash instead). Posted 6/27/2011 5:03pm by Vicki Phillips. My yoga teacher talked about abundance last Friday, urging us to observe the abundance within ourselves. But later, after returning from the grocery, what I observed was abundance upon the kitchen counter. A couple of red tomatoes, yellow cherry tomatoes, an avocado, red onion, yellow onion, apples, new potatoes, a lemon – all huddled together for a real homey, rustic, colorful look of abundance. Add to that all the fresh-picked, green produce from the CSA, and it’s enough to make one feel abundant indeed. Because when you start with great produce, you cook great meals. It’s that simple. And with last week’s fresh greens, lettuces and herbs, I nailed three great dinners. Well, almost. User error came into play on Friday night, when I fixed butternut squash ravioli with sage brown butter. Taste: exquisite. Appearance: hmm. I used wonton wrappers instead of making my own ravioli dough. This was lots easier, but you still have to assemble the raviolis individually, which is quite time-consuming. After carefully assembling 25 raviolis, I proceeded to boil them all at once (mistake #1, as they were too crowded in the pot) and then dumped them en masse into the colander like it was a big pot of spaghetti instead of 25 individual, delicate pillows (mistake #2). They all stuck together and I had to spoon them out like mashed potatoes. Also I got started too late for such a labor-intensive project (mistake #3). Ray and I finally sat down to eat our ravioli and salad at about 9:30. Still, I would prepare this Emeril Lagasse recipe again in a heartbeat because it was THAT delicious. And Ray didn’t mind the carbs – he said the dish was restaurant quality. I’m fairly certain he was referring to its taste, not its funky appearance. On Sunday I made salmon topped with lime and dill in foil packets. I popped them in the oven for about 20 minutes – so easy! – and served the salmon with sautéed spinach. The salmon was pricy at $6.99 per fillet, but wow, was it worth it. And finally the kale dish suggested by Susan Evans in her cooking demo. Simple recipe: Saute some garlic and onion with pancetta in nice big skillet. Remove the cooked pancetta and set aside, then cover so you won’t nibble at it. To the skillet add coarsely chopped kale and a cup of chicken broth. Season with salt, black pepper and crushed red pepper. Braise slowly, covered, for 20 minutes. Meanwhile, cook some whole-wheat spaghetti. When done, remove spaghetti with wire skimmer and add to skillet along with about half a can of white beans (e.g., garbanzo, cannellini, Great Northern) and reserved pancetta. Stir it all together, heat for a few minutes and adjust seasoning. If too dry, add a little pasta water. Serve with a sprinkling of grated Parmigiano Reggiano cheese. A healthful, tasty, one-pot meal. And the freshness of the kale made it a star ingredient rather than a side thought. Adding peas and herbs to salads, eating lots of salads throughout the week, I was able to use up nearly everything. By the time of the second distribution on Tuesday, the only things left were a bit of lettuce, which I ate that evening, and the oregano. Stumped, I finally decided to take my friend Rob’s advice and dry the oregano by hanging it upside down over a jar in the pantry. This week we received more oregano, which has joined last week’s batch in the drying jar. If this herb-drying project turns out well – what can go wrong? – I plan to use the oregano in a big batch of pizza sauce for freezing. Also in this week’s distribution were lettuces, spinach and kale; cilantro, parsley and dill; and both sugar snap and shelling peas. Having devised a plan for it all, I’m especially eager to make a dish I saw Jamie Oliver prepare on TV. It was potato salad with smoked salmon, dill and horseradish crème fraiche, which I’ll serve with peas and arugula. Abundance galore. Posted 6/24/2011 5:33pm by Josie Hart Genter. We hope you all are enjoying the spinach, greens, herbs, salad and peas in your kitchen! Planning on going out of town for the long weekend? If you know you will be missing your weekly CSA distribution you are welcome to share your weekly harvest with a friend, neighbor, or relative who loves veggies. All they need to do is sign in for you and a staff member can help them pick out their produce. Don’t forget the bags! 1. Place the potatoes, onion, garlic, water, salt and mustard in a soup pot or Dutch oven. Bring to a boil, then cover and simmer very slowly for about 20 minutes. 2. Use a food processor or a blender to puree the soup with all its solids, adding the spinach and fresh herbs along the way. 3. Return the soup to the pot and heat slowly. Add black pepper to taste. Serve hot, with a drizzle of yogurt and a dusting of mild paprika on top, if desired. Clear out your refrigerator because our veggies are growing fast! Beets, basil, broccoli, cabbage, summer squash and carrots are on their way! We’ll also start seeing potatoes in the next few weeks as well! Don’t throw away your veggies tops! Instead of throwing away the nutrient-rich vegetable tops of radishes, carrots, parsnips (to name a few) or the stems of parsley or kale, try using them. One great method is making a vitamin rich smoothie. This may look like green goo, but it’s a great way to get the nutrients you need in the middle of summer heat. Wash the greens, blend ingredients together and enjoy getting your daily vitamins in a very cool way! Stay tuned for more ideas on how to use the whole vegetable that you are receiving each week. This smoothie is good for you and much cheaper than buying a fancy green smoothie at the store. Posted 6/17/2011 6:20pm by Vicki Phillips. Along with the other CSA shareholders, I gathered several tote bags and drove out to Chatfield yesterday afternoon. Strangers all, we smiled and nodded at each other in passing like we were old friends — I guess we’re new “veggie pals.” I had decided against bringing my father, which was a good decision because he couldn’t have tolerated walking and standing in the hot sun. For me, though, it was a delightful couple of hours at Chatfield. The staff had begun harvesting at 5:30 that morning, but nevertheless they were perky and eager to help us select our produce. Leigh Rovegno, who heads the Chatfield CSA, gave an informative tour of the gardens — I learned about “fish and kelp emulsion” and “smart farming” (who knew?) — followed by Susan Evans’ fun cooking demonstration. I stopped on the way home to buy a box of GreenBags, which Susan highly recommends. Once home, I washed and bagged all 11 items: salad mix, arugula, sugar snap peas, kale, spinach, a head of lettuce and 5 herbs: cilantro, parsley, dill, oregano and sage. All subsequent pickups will be a whole week apart, but for those of us picking up at the Denver Botanic Gardens’ York Street location, these first two pickups are only 5 days apart. Moreover, I had previously arranged to dine out with friends both that evening and Saturday night. That left just 3 dinners before the next distribution on Tuesday. Thus I set about formulating a plan for eating everything up. Friday: Butternut squash ravioli with sage butter and parsley garnish, along with a salad using the salad mix, arugula and peas. Not sure if hubby Ray will welcome the ravioli, as we try to limit carbs for weight control. Oh well, I’m sure he’ll love it. Sunday: Grilled salmon with dill on a bed of spinach, along with a salad using the butter lettuce and peas. Monday: Susan gave us a recipe for braised kale and butter beans, which I thought would go well with pork chops. On the other hand, the dish sounds fairly hearty because of the beans, so I might just serve it by itself and jump on Paul McCartney’s “meatless Mondays” bandwagon. The cilantro I’ll use in pico de gallo which, along with homemade tortilla chips, will do for a pre-dinner nibble or afternoon snack. And I’ll be lunching every day on salad to use up the rest of that tender butter lettuce — which is just fine by me! I was actually surprised that the quantity received in this first distribution seems quite manageable. But Susan said we’ll be getting more and more as the season progresses. Stay tuned. Posted 6/17/2011 4:12pm by Leigh Rovegno. Thank you for making it out to our first distribution last night! We realize that for some of you, it was a longer drive than usual but we are all glad everyone had a chance to see where your food is coming from. We hope you also enjoyed the cooking demonstration with Susan Evans. If you weren’t able to purchase a CSA tote bag, they will still be available for sale at next week’s distributions. Please keep in mind the times and location of your distribution. If you are picking up your produce at York St., we will be at the south end of the top level of the parking structure from 4:30 - 7 p.m. If you are picking up your produce at Chatfield, we will be in the CSA washstand, located in the Hildebrand Ranch area. Please park in the old schoolhouse parking lot and walk to the washstand. We will be there from 4:30 - 6:30 p.m.
Heat oils over medium heat. Add garlic and ginger and saute for one minute. Add tamari/soy sauce and sesame seeds. We have a new resident CSA blogger, Vicki Witt Phillips. She already has posted her first blog on our website with a very enthusiastic welcome from our community. Vicki’s blog will focus on her first experiences, thoughts and insights on being a CSA member. Ever felt vegetable anxiety? Or just simply overwhelmed by all your produce? Vicki will make you laugh and make you feel reassured you can handle a huge bunch of radishes or something else you may have never seen before. Posted 6/14/2011 2:23pm by Leigh Rovegno. Please note that distribution for all members is this Thursday, June 16 at Chatfield. The first York St. distribution will occur Tuesday, June 21. Starting June 21, York St. distribution will be every Tuesday from 4:30 – 7 p.m.
Chatfield distribution will be every Thursday from 4:30 – 6:30 p.m.